On August 28, 2018, the FASB issued ASU 2018-13,1 which changes the fair value measurement disclosure requirements of ASC 820.2 The amendments in this ASU are the result of a broader disclosure project called FASB Concepts Statement, Conceptual Framework for Financial Reporting — Chapter 8: Notes to Financial Statements, which the Board finalized on August 28, 2018. The Board used the guidance in the Concepts Statement to improve the effectiveness of ASC 820’s disclosure requirements. This Heads Up summarizes the key provisions of ASU 2018-13, including the new, eliminated, and modified disclosure requirements of ASC 820. As noted below, the applicability of the changes the ASU makes to ASC 820 can depend on whether the entity is a nonpublic entity.3 Unless specified below, the changes apply to all entities. The appendix contains illustrative examples from ASU 2018-13. The ASU is effective for all entities for fiscal years beginning after December 15, 2019, including interim periods therein. Early adoption is permitted for any eliminated or modified disclosures upon issuance of this ASU. The table below summarizes the amendments to the fair value measurement disclosure requirements of ASC 820 that will take effect upon adoption of ASU 2018-13. The table is followed by a detailed explanation of the key changes. c. How changes in fair value measurements affect an entity’s performance and cash flows. The new disclosure requirements in ASU 2018-13 discussed below are not applicable to nonpublic entities. Under ASU 2018-13, entities are required to disclose the amount of total gains or losses for the period recognized in OCI that is attributable to fair value changes in assets and liabilities held as of the balance sheet date and categorized within Level 3 of the fair value hierarchy (see ASC 820-10-50-2(d)). This disclosure requirement is incremental to the existing requirement to disclose such total unrealized gains or losses for the period recognized in earnings (or changes in net assets) under ASC 820-10-50-2(d). A nonpublic entity is not required to apply either of these requirements. Entities currently must provide quantitative information about significant unobservable inputs for Level 3 fair value measurements. The amendments under ASU 2018-13 add an incremental requirement for entities to disclose (1) the range and weighted average used to develop significant unobservable inputs7 and (2) how the weighted average was calculated for fair value measurements categorized within Level 3 of the fair value hierarchy. Entities may disclose other quantitative information in lieu of the weighted average if they determine that such information embodies a more reasonable and rational method of reflecting the distribution of significant unobservable inputs used to develop Level 3 fair value measurements. In these cases, entities are not required to disclose their reasons for omitting the weighted average. ASU 2018-13 was initially drafted to exempt only private entities8 from the new disclosure requirements and certain modified disclosure requirements as set forth below. During redeliberations, respondents proposed that these exceptions also be extended to not-for-profit organizations and nonpublic employee benefit plans on the basis that these nonpublic entities are granted greater access to management and are therefore able to obtain additional information more readily. In light of these arguments, the Board concluded that such information would not be cost beneficial for these entities and extended the exemption to all entities meeting the definition of a nonpublic entity. The Board also considered requiring entities to disclose the time frame used to develop significant unobservable inputs for fair value measurements categorized within Level 3 of the fair value hierarchy. However, this proposed amendment was ultimately dropped amid concerns that the time and cost incurred to produce these disclosures would outweigh the benefits. ASU 2018-13 eliminates the requirement for entities other than nonpublic entities to disclose the reasons for and amounts of transfers between Level 1 and Level 2 for assets and liabilities held at the end of the reporting period that are measured at fair value on a recurring basis. The Board does not believe that the benefits of this disclosure outweigh the costs. Under current U.S. GAAP, entities must develop and consistently follow a policy for determining when transfers between fair value hierarchy levels have occurred. This requirement is unchanged as a result of adoption of ASU 2018-13; however, the ASU eliminates the requirement to disclose this policy in the notes to the financial statements. ASU 2018-13 also removes the requirements in ASC 820-10-50-2(f) (and related implementation guidance under ASC 820-10-55-105) for entities to disclose their valuation processes. Level 3 rollforward — Under ASU 2018-13, nonpublic entities are not required to complete a reconciliation of the opening balances to the closing balances of recurring Level 3 fair value measurements. 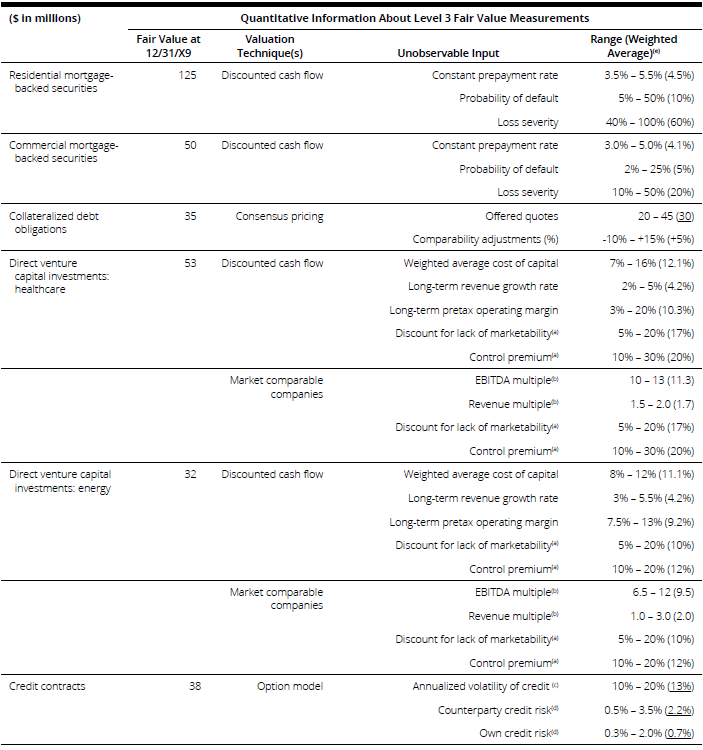 Rather, such entities are required to separately disclose for these Level 3 fair value measurements only changes during the period attributable to (1) purchases and issues (each type separately) and (2) transfers into or out of Level 3 (each type separately, and the reasons for those transfers must also be disclosed). ASU 2018-13 does not change the quantitative Level 3 rollforward disclosure requirements under current U.S. GAAP for entities that are not nonpublic entities. 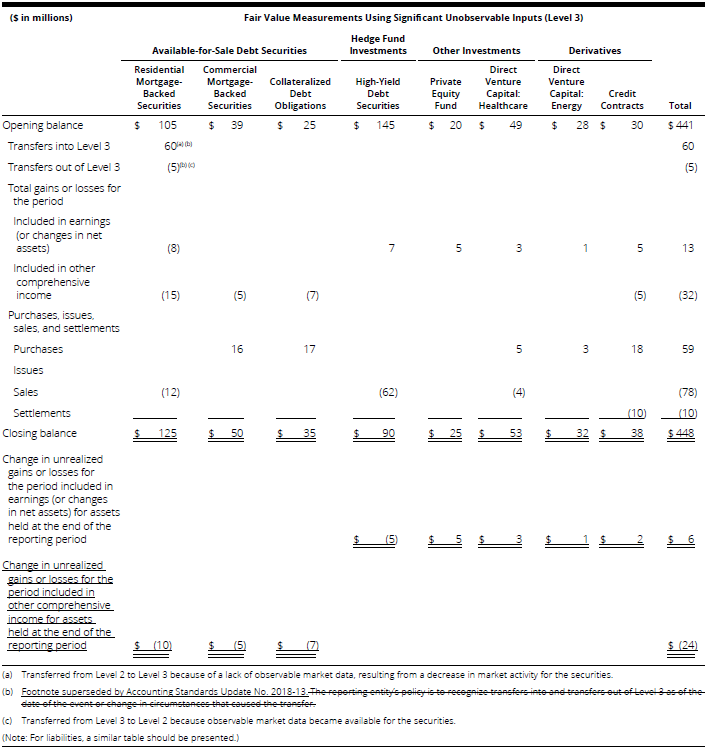 Because many users of financial statements supported the requirement that entities disclose a Level 3 rollforward given the insights it reveals about management’s decisions, the Board considered whether a rollforward of Level 1 and Level 2 assets and liabilities would provide similar utility. However, feedback from preparers and practitioners indicated that current systems are not designed to track an asset’s or liability’s fair value hierarchy and that preparation of such rollforwards would be a labor-intensive exercise. The Board ultimately decided that a Level 1 and Level 2 rollforward would not be cost beneficial. Measurement uncertainty — ASU 2018-13 amends the section of the Codification that requires other-than-nonpublic entities to provide a narrative description of the sensitivity of the fair value measurement to changes in unobservable inputs. The ASU clarifies that such entities are (1) required to communicate information about uncertainty in measurement from the use of significant unobservable inputs that could have been different at the reporting date and (2) are not required to disclose information about sensitivity to future changes in fair value. Under ASU 2018-13, entities are no longer required to estimate and disclose the timing of liquidity events9 for investments measured at fair value. Instead, the requirement to disclose such events applies only when they have been communicated to the reporting entities by the investees or announced publicly. If the timing is unknown, the entities are required to disclose that fact. The objective of this change is to prevent an investor from having to make its own estimate when it does not have knowledge of the timing from the investee or another public source. ASU 2018-13 is effective for all entities for fiscal years beginning after December 15, 2019, including interim periods therein. Early adoption is permitted upon issuance of this ASU, including in any interim period for which financial statements have not yet been issued or made available for issuance. Entities making this election are permitted to early adopt the eliminated or modified disclosure requirements10 and delay the adoption of all the new disclosure requirements11 until their effective date. The examples below are reproduced from ASU 2018-13 (added text is underlined, and deleted text is struck out). 55-101 For recurring fair value measurements categorized within Level 3 of the fair value hierarchy, this Topic requires a reconciliation from the opening balances to the closing balances for each class of assets and liabilities, except for derivative assets and liabilities, which may be presented net. A reporting entity might disclose the following for assets to comply with paragraph 820-10-50-2(c) through (d). 55-103 For fair value measurements categorized within Level 2 and Level 3 of the fair value hierarchy, this Topic requires a reporting entity to disclose a description of the valuation technique(s) and the inputs used in the fair value measurement. For fair value measurements categorized within Level 3 of the fair value hierarchy, information about the significant unobservable inputs used must be quantitative. A reporting entity might disclose the following for assets to comply with the requirement to disclose the significant unobservable inputs used in the fair value measurement in accordance with paragraph 820-10-50-2(bbb). 1 FASB Accounting Standards Update (ASU) No. 2018-13, Fair Value Measurement (Topic 820): Disclosure Framework — Changes to the Disclosure Requirements for Fair Value Measurement. 2 FASB Accounting Standards Codification (ASC or the “Codification”) Topic 820, Fair Value Measurement. a. Its debt or equity securities trade in a public market either on a stock exchange (domestic or foreign) or in an over-the-counter market, including securities quoted only locally or regionally. b. It is a conduit bond obligor for conduit debt securities that are traded in a public market (a domestic or foreign stock exchange or an over-the-counter market, including local or regional markets). c. It files with a regulatory agency in preparation for the sale of any class of debt or equity securities in a public market. d. It is required to file or furnish financial statements with the Securities and Exchange Commission. 4 Nonpublic entities are still subject to the quantitative requirements in ASC 820-10-50-2(bbb)(2) but are not subject to the requirements in ASC 820-10-50-2(bbb)(2)(i). 5 Under current U.S. GAAP, nonpublic entities are exempt from this disclosure requirement. Accordingly, elimination or modification of this disclosure requirement by the ASU does not affect nonpublic entities. 7 See the example from ASC 820-10-55-103 in the appendix. 9 See ASC 820-10-50-6A(b) and (e).